When carrying out spring cleaning duties, many overlook the importance of cleaning the exterior of their homes and focus on the interior instead. Regular cleaning and maintenance of your garage door will not only enhance the look of your property, it will also give you the chance to inspect your garage door, checking all the mechanisms are in top working order. Our experts at Wessex Garage Doors have compiled a list of top tips to help you give your garage door a thorough spring clean and prolong its life in the process. Once you have finished cleaning, we recommend that you apply a layer of specialist wax to keep the door in good condition and protect the finish of the metal. It’s important to inspect your painted garage door during the cleaning process, keeping an eye out for any paint flaking or warping on the surface, or indications of the metal underneath the paint showing through. That way, you can detect any signs of rust which will mean your door needs repainting to prevent corrosion. Using the above cleaning method, remove any dirt or grime on the interior of your garage door (particularly in the tracks) as this can damage the door’s mechanisms if it isn’t dealt with correctly. While the inside of your garage door cannot typically be seen from the exterior of your property, keeping it clean and well-maintained will improve its overall longevity and functionality. 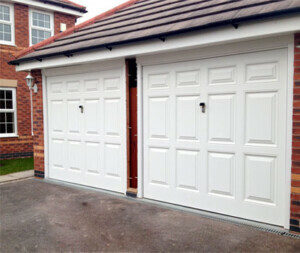 If you find any damage when cleaning and inspecting your garage door, it must be dealt with quickly and efficiently. Here at Wessex Garage Doors we offer a comprehensive repairs service to ensure your garage door remains fully functional and safe to use. Simply get in touch with our friendly team today for further information or to arrange a free home visit and survey.